Choose UPF-rated fabrics not treated with chemicals. UPF-rated fabrics (such as swim suits and rash guards) are often coated or embedded with chemical sunscreens or nanoparticle mineral sunscreens in order to achieve UV protection. As the fabric ages, these chemicals can rub off onto skin and into the environment. Luckily, chemical treatments are not the only way to create UPF fabrics. Fabric can be UV protective simply by the nature of the weave. The following brands, according to their product pages and websites, contain no chemical treatments and achieve UV protection solely through the color and weave of the fabric. Minimize the risks of chlorinated pools. Swimming in chlorinated pools poses health risks, such as exposure to respiratory irritants and suspected carcinogens. Unfortunately, for most of us, chlorinated pools are the only option for summer swimming. But you can minimize the effect of the toxic chemicals present in and around chlorinated pools by taking certain steps. First, choose a properly maintained, not too crowded, outdoor pool. A well-maintained pool has little or no disinfectant odor and does not cause discomfort to swimmers' lungs and eyes. Contaminants from swimmers such as sweat, hair, sunscreen, or urine mix with the chlorine in the pool to form hazardous disfectant by-products. A less crowded pool means fewer contaminants. Choose an outdoor pool because indoor chlorinated pools limit ventilation and increase exposure to toxic chemicals. Second, get rid of chlorine on and in your body as soon as possible after swimming. Immediately after swimming, shower to remove harmful chemicals from skin. Seek fresh air to remove harmful chemicals from the lungs. Learn more about safely enjoying chlorinated pools here. Avoid toxic chemicals in the backyard. I am a big fan of outdoor play for kids and adults, especially in the summer. Unfortunately, there are several ways that we adults inadvertently make our backyards less of an ideal play location for our children by introducing toxic chemicals. You can make sure that your backyard stays safe and eco-friendly this summer by using pesticide-free bug control around your house, skipping synthetic fertilizers in favor of organic lawn care, choosing pvc-free backyard pools and pool gear, using non-toxic sand and pesticide-free play structures, and using a lead-free hose. 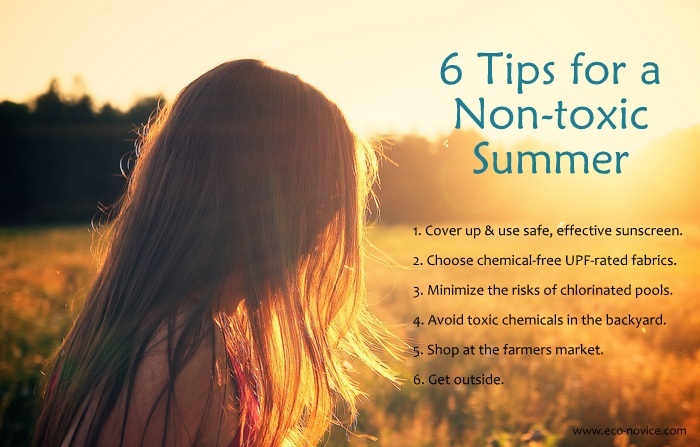 Find out more about avoiding toxic chemicals in the backyard and safer alternatives here. Are you trying to avoid pesticides in your family's diet? Would you like your kids to eat more whole foods and fewer processed ones? Have you been wanting to switch to more organic, local, and seasonal produce? This is the best time of year to start. In the summer, farmers markets are bursting with a huge variety of fresh and delicious fruits and vegetables (often organic or pesticide-free) at affordable prices. The organic produce I buy at my farmers market is the cheapest organic produce I can buy. But I also sometimes purchase from non-organic farms if I know they don't use pesticides on their fruit. One of my favorite benefits of shopping at the farmers market is the ability to have a direct relationship with the producers of my food. When I ask a farmer if they spray their fruit with pesticides, I feel confident that I will get an honest and accurate answer. Not every small-scale family farm can afford the organic certification process, so it is worthwhile to ask a vendor if they use fertilizers or pesticides if you are interested in their produce. To find your local farmers markets, you can search by zip code on localharvest.org, ask neighbors and friends, check local magazines, or search online for farmers market associations in your state, county, city or metropolitan area. Find my top ten tips for getting the most out of your farmers market here. Time outdoors improves mood and mental health, diminishes sensations of pain, and reduces mild attention-related disorders in kids. Getting outside is especially important in the digital age because time outside seems to counteract many of the negative effects of screen time. The benefits of spending time outside in natural spaces are even greater. Time in nature boosts immune function, improves attention and memory, relieves anxiety and depression, and extends life span (see more benefits here). Put another way, too much time indoors is hazardous to your health. My foolproof methods for enticing children outdoors include popsicles, bubbles, sidewalk chalk, a camera, water play, and art supplies (find more ideas here and here). For older kids, try exploring and documenting nature in your own backyard for real scientists through Citizen Science Projects, go geocaching, encourage digital nature photography, or download a cool nature app. Find additional resources for connecting kids with nature here. A debt of gratitude is in order for sharing. All you impart to us is forward and very educational; I might want to bookmark the page so I can come here again to peruse you, as you have made a superb showing with regards to. I have the involvement with one administration custom essay writing service, it is exceptionally bona fide and accommodating to composing altering and arranging paper record additionally gives totally extraordinary experience of article composing for the understudies.